CALMING CRUNCHIES are Pooch & Mutt’s natural, ethical and delicious treats. Calming Crunchies are 75% British duck, and also include chamomile, lavender, prebiotics, B-vitamins and L-tryptophan. They are also low-calorie, and free from grain, cereal and gluten. Chamomile was traditionally used in ancient Greece, Egypt and beyond to aid relaxation. L-tryptophan is essential to form serotonin, the ‘feel good’ neurotransmitter. Each pack contains approximately 30 medium sized bones. As baked treats the bones can easily be broken down into smaller bits and used for training, or can be fed whole as a substantial treat. 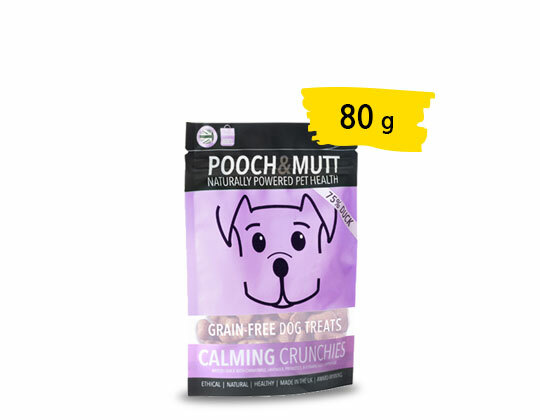 Calming Crunchies are the perfect treat before bed time, during walks and as an on the go treat.